Meraki MA-SFP-1GB-SX compatible 1000Base-SX SFP transceiver (MMF, 850nm, 550m, LC, DOM). 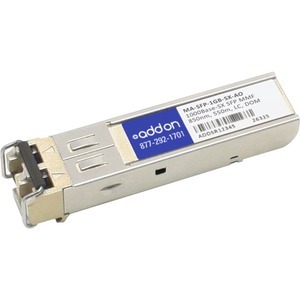 An Meraki now Cisco SFP transceiver that operates at 850nm over multi-mode fiber, with a maximum reach of 550m connected via a LC connector. This Meraki now Cisco compatible SFP transceiver has been programmed, uniquely serialized, and data-traffic and application tested to ensure it is 100% compliant and functional. Our SFP transceiver will initialize and perform identically to Meraki now Cisco's transceiver and is built to meet or exceed Meraki now Cisco's specifications, and comply with MSA (Multi-Source Agreement) standards. The actual part shipped may have a different part number, but will be functionally identical and 100% compatible. Trade Agreements Act (TAA) versions of this part are available.